T and D and cinemas really don’t mix well, there’s the need for T to know absolutely everything about the timetable, the fact that both he and D become anxious about having to sit next to or near strangers (with T there’s an element of annoyance too) and that if either of them don’t engage with the film, they want to leave immediately. There are autism-friendly showing of films, but our local (well, it’s a train ride and a walk away) cinema doesn’t offer them. We were given a gift card at Christmas for the cinema, sufficient enough for the four of us all go mid-week twice. It was a lovely thoughtful gift, but then my children aren’t the easiest to buy for, they don’t “play” with toys and have very specific likes and dislikes. I’d hoped we could head off this summer to either see “Inside Out” or “The Minions”, we haven’t got there yet. Neither seem keen (despite the fact they both howl with laughter at Minions) and I’ve since discovered that when booking online with a card (gift, debit or otherwise), you have absolutely no say about where your seats would be, it’s all decided by cinema staff in advance. So, definitely not ideal. Our chosen position would always be near the front and away from others, in case a quick exit is needed, there’s no back row for us. So, we’ve had our kind of cinema today, not without it’s incidents. 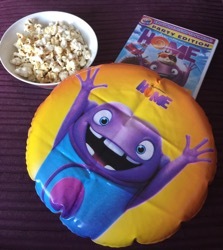 The plan was to watch “Home”, something they were both looking forward to, in fact D hunted this down eagerly in the supermarket during one of our girlie town trips. The disc in the picture is an inflatable frisbee that came with it and that’s fun in itself! The scene was set: curtains drawn; popcorn in bowls, places on the sofa and Bunny to hand (as ever). The disc started to play and then the anxieties started for D. She didn’t know if she’d like the film, despite the fact she’d loved to point out the posters on the buses, happily chose the DVD and had kept telling me that the character which looked like a guinea pig wasn’t, it was a cat called “Pig”. We had some unsuccessful gentle negotiation and after ten minutes I admitted peaceful defeat and went to turn it off. She then got very curious about what would happen next in the film, but was still adamant she didn’t want to watch anymore. She choose an old favourite “Cloudy With A Chance Of Meatballs 2” and the calm status quo returned. Imagine the above scenario in a cinema, near to strangers and you get an idea of how it is. So, we’ve had our cinema, albeit not the one originally planned but that’s how we roll. Expect the unexpected is never truer. Maybe next time we’ll get a bit further in than ten minutes, maybe I’ll have to watch it through myself so that I can tell her that it’s all okay and there are funny bits (I presume there are). A cat called “Pig” is enough to make you assume so, isn’t it? As for the giftcard, perhaps I’ll phone them, see if there is anyway around not knowing where we’d sit (if we got there), spread a bit of autism awareness. As one supermarket says “every little helps”, it certainly does with a disability that isn’t physical, an invisible one. Autism. Kim Carberry on 22nd August 2015 at 8:58 pm. It doesn’t matter what film you watched as long as you all had a good time and it sounds like you did! Jeannette on 23rd August 2015 at 5:15 pm.